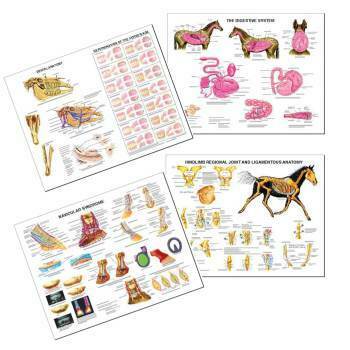 Produced by Anatomical Chart Company, these scientific and medical illustrations are designed in consultation with veterinarians and zoologists to develop charts illustrating the anatomy, systems, structures, diseases and conditions of selected domestic animals. The first installment in this new line of veterinary charts are the Skeletal Anatomy of the Horse, the Cat, and the Dog. A detailed illustration of the animal and its skeletal system and specific diseases are also illustrated. Each chart measures 26" by 20" and is printed on high quality heavy paper. All charts are available in paper, flexible lamination and rigid lamination.